- The Tranquility Body Polish is a gentle moisturizing scrub treatment for the body. Pure brown sugar blended with the world's finest oils results in an entirely natural and stimulating exfoliant. Then all natural grapeseed oil is applied to finish this moisturizing polish. - The Aromatouch Technique is a clinical approach to essential oil application. Using all natural therapeutic essential oils, this treatment creates an environment for optimal health in your body by reducing stress, boosting immunity, addressing inflammation and stimulating lymphatic movement. You are left cleansed of toxins. - The Infrared Body Wrap is a natural heat therapeutic treatment which uses Far Infrared Heat Energy (FIR) that penetrates twice as deep as other heat sources to target toxins and cellulite trapped in pockets below the surface of the skin. Using the body's natural cooling system, the deep heat treatment simulates metabolism and helps to reduce cellulite, burn calories, remove stored toxins, increase weight loss, and help to contour one's body. Simultaneously, the deep penetrating heat will help relieve chronic pain, improve joint mobility and increase blood circulation. - European facial with customized essential oils. The focus of your facial treatment is to clear congested pores, restore healthy moisture, and rejuvenate your natural tone while creating a sense of serenity. This is accomplished through a uniquely customized facial treatment. It will include the skin analysis followed by a deep cleansing, steam, specific exfoliating mask for your skin, extractions (removing deeper congestion from pores), relaxing massage (facial, neck, hand and arm massage), hydrating mask and end with treatment serums and moisturizer. - This mini facial is designed to diminish the signs of aging. It includes a skin analysis, cleansing, enzyme peel, stem cell mask, and massage on the neck and shoulders. -This unique combination of acupressure and Zen Facial Massage balances the emotions and results in relief from tension and migraine headaches, neck pain and sinusitis. A combination of unique essential oils are used. -Hot Stone Therapy melts away tension, eases muscle stiffness, and increases circulation and metabolism. During this therapeutic facial not only will your mind and soul find comfort, but your skin will be transformed. After cleansing and steam with a Berry sugar scrub. 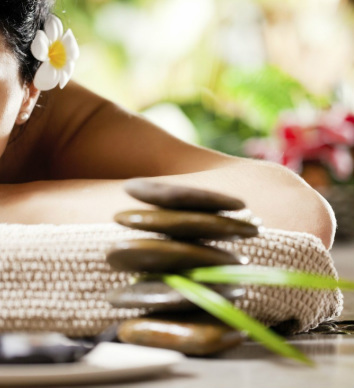 Hot stones will then be gently massaged on the face to stimulate blood flow to carry the nutrients deeper into the skin. The warmth of the stones will relieve muscle tension and sinus pressure. As you relax in a honey and wine facial mask your hands, neck and arms will be massaged. -Collagen is a naturally occurring protein that is found in the skin, tissues and bones; in the skin, it is found in the lower dermis layers, and is responsible for maintaining skin structure and strength. A collagen facial attempts to retard the aging process by replenishing the skin's natural proteins by external application. Daily stress, environmental factors, toxins and fatigue quickly diminish skin’s radiance and encourage the aging process. Featuring an unsurpassed formula, the Spa Clinica Micro-Retinol facial combines deep cleansing, potent yet gentle peel and Micro-Retinol treatment to recapture smoother, firmer, brighter and younger-looking skin instantly!